AK Imagery Blog: Merry Christmas! Merry Christmas! I hope that everyone gets a chance to spend some time with their family (or away from their family if that's what makes them happy) and folks have a safe and restful holiday. Tomorrow is Boxing Day in Canada (and a few other Commonwealth countries). In the past I've spent boxing day getting up early and hunting for deals on various cool electronic gadgets. Futureshop started their web boxing day specials yesterday. I looked through for some deals. Sadly after comparing even their door crasher prices to what I could get from various online retailers back home it doesn't seem worthwhile, especially if one has to start lining up before 6 am. Starting tomorrow we'll be out and about visiting friends and family in the Southern Ontario area. Technical Specs: Canon 1D3, 24-70@54mm, f/8, 1/50s, ISO 3200. P.S. 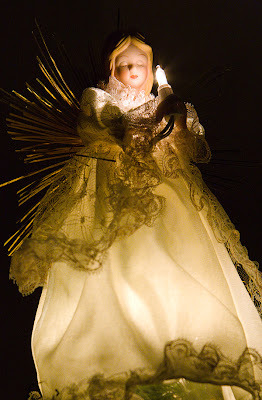 The picture is of an angel perched atop the Christmas tree.